Die Freisinger Bierkeller–more pictures here. Couple weeks ago I took a city tour focused on the history of beer in Freising. Short summary: most of the buildings in the Hauptstrasse were used as breweries at some point in the last 800 years. The Domberg had a brewery that served the bishops and their guests; the assorted monasteries around town did as well (beer from the former Weihenstephan Abby is available all over the US, if you want to try some beer made in Freising). There were also private breweries to serve the people of the town, as many as 18 at once. It ended up being a two-and-a-half-hour tour. In the afternoon sun. Had to stop at the Hofbrauhaus Freising on the way home. One stop on the tour was a series of four cellars that were dug out of a large hill in the 19th century under what is now a Biergarten/nightlife spot. They were filled with ice during the winter, and kept giant barrels of beer cool during the summer months. (The “Miller caves” in Milwaukee were dug for the same reason.) Even without ice the air was quite cool. There was a series of ducts for fresh air, and the floors are sloped so the melted ice could run off into a nearby stream. 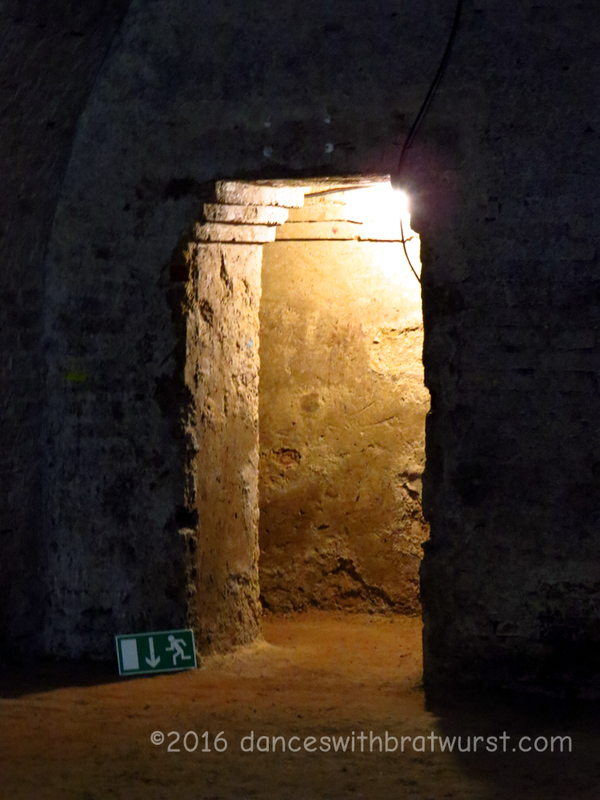 A bit of Freising history underground.